This special recipe comes from Jihea's Kitchen. 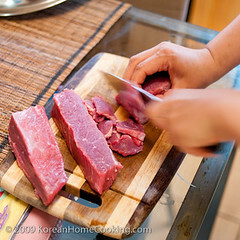 Again, Jihea is a gifted cook who knows how to cook what seems to be a very difficult dish in the easiest way possible. 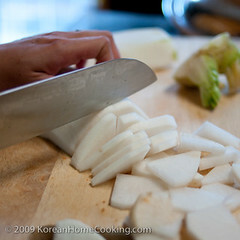 I can probably summarize in just three steps how she made this yoogaejang. 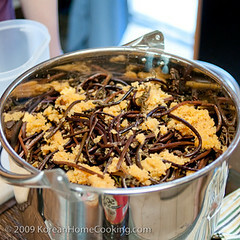 1) Cut all ingredients, 2) Mix them with sauce, and 3) Add water and boil. I am so glad I had a chance to learn this recipe from her. For those of you who are used to making only 1 to 2 servings of foods like me, "20+ servings" may sound a bit overwhelming at first. But I think this soup is worth making in such a quantity since you can store them for later use. According to Jihea, freezing left-over yoogaejang comes very handy when you don't feel like cooking but want to have a nice warm soup for dinner. Or, you can always invite friends over for dinner. 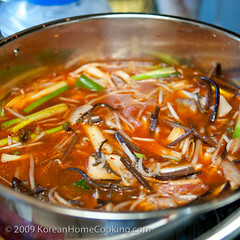 Yoogaejang is a type of soup that you make in a large quantity and serve all week until you get tired of it. Growing up in a family of six with four children, my mom often prepared foods in large pots that is a size of paint bucket. 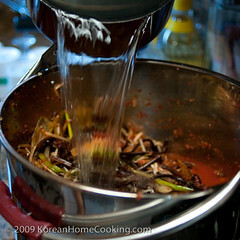 When she made yoogaejang, one of the biggest pots in our house showed up. And I remember, I used to love seeing them because I knew something special was coming up for dinner. Please note that the ingredient quantities are only approximate. Please adjust the amount to your taste. 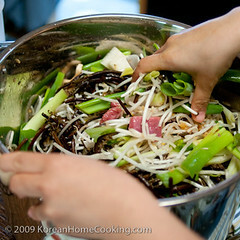 Main ingredients in clockwise direction: radish (peeled), oyster mushroom, mung bean sprouts, Korean leek, green onion, beef brisket. 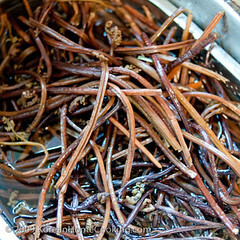 Another main ingredient is gosari, dried braken fern. Soak in water overnight and boil for approx 30 minutes. Then soak in cold water for another 6+ hours. Cut leek in half lengthwise and then split in half. 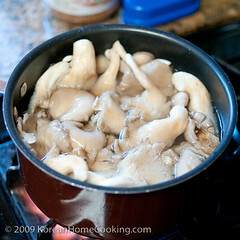 Half-cook oyster mushroom in boiling water. 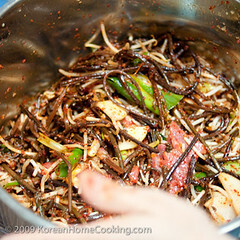 Add [Korean] soy sauce and thoroughly mix all the ingredients together. Once it boils, heat for approx 3 hours over low to medium heat . Add salt and/or some more soy sauce to season. This looks so good! I'm ready for winter so I can bust out some spicy soup!!! yuuuuuuumy!, i need to find a day to make this =) tyy, great blog! My favorite soup! Can you please leave a recipe for mandu? oh i love this soup!!! do you think it will be weird if i dont put gosari in it. i dont think i can find it here. Stephanie, gosari is one of the key ingredients for this soup. I saw Hmart.com sells gosari. If you live in the US, try ordering from there. If you live outside of US, I guess you have no choice. I think the soup will be still good with all vegetables in the soup. Put lots of leek instead. my mom makes that soup in that ginormous bucket like pot too when she makes. yum, yum! Hello there: One of my all-time favorite dishes when I go out for Korean. 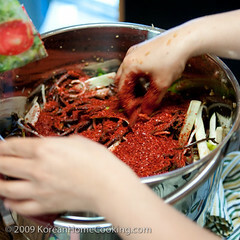 I love that you use the traditional ingredients like kosari. Some westernized recipes leave it out. Question -- your recipe says leeks, but the picture shows green onions. 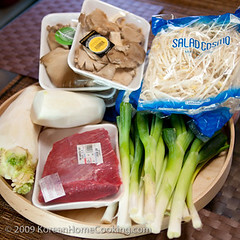 Also, most recipes I see have you boiling the beef first to make the broth, then cook again with the veggies and sauce. You do it all at once. Does it make a difference? Hi Mike- Sorry for the late response. 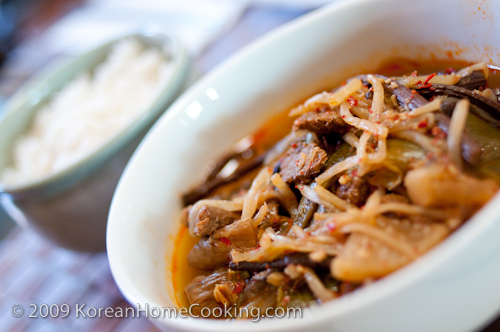 Yookaejang is one of my favorite Korean soups, too! 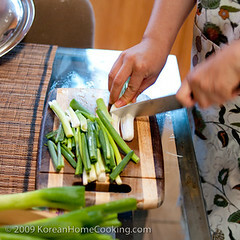 First of all, I used korean leek (shown in picture), not green onion. Korean leeks look very similar to green onions/scallion; They are not as fat as American leek but taller and slightly larger in size. American leek works well well for this soup also since they have wider leaves. To your second question - I combined all at the same time for the convenience purpose. And, I think they still taste very good. I know some people go through making beef stock first before adding vegetables. I am sure this is good, too.